Jakarta Governor, Anies Baswedan stated that Jakarta Provincial Government prioritizes consolidation in the management and utilization of social media.
" All admin operators are consolidated to connect all information"
"All admin operators are consolidated to connect all information. 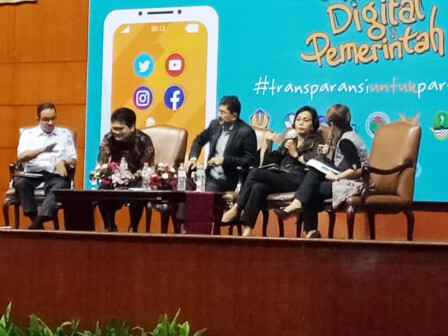 They are also in one group to accelerate the delivery of information," expressed Anies, when he became one of the panel discussion speakers with the theme "Government Digital Media Festival" with #hashtag #transparencyforparticipation, in one of the hotels, South Jakarta, Wednesday (12/5). He explained that consolidation is very important thus the government can convey information correctly and respond to problems quickly, and there is consistency. "Once there is information, we meet. We bring together SKPDs that have relevance for managing social media in the same room, thus they can interact," he uttered. The rapidly developing phenomenon of social media is part of the fact, and should not be interpreted as a problem. But, the most important thing is to have the right strategy. "Criticism on social media is normal, no need to overdo it," he stated. As for the information, the meeting was also attended by Finance Minister, Sri Mulyani; KPK Vice Chairman, Laode M Syarief; and Ministry's Director General for Post and Informatics Management, Ahmad M. Ramli, as a speaker.